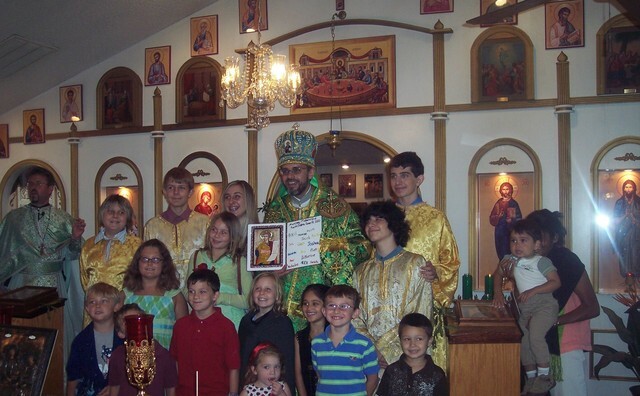 Ukrainian Orthodox Church of the USA - Bishop Daniel Visits Ukrainian Orthodox Parish in Dover, FL! Bishop Daniel Visits Protection of the Most Holy Mother of God Ukrainian Orthodox Church in Dover, FL! Protection of the Most Holy Mother of God parish in Dover Florida was honored with the visit of His Grace Bishop Daniel on Great and Holy Pentecost of 2010. Many showed up for Vespers on Saturday evening to inaugurate the feast with His Grace in our midst. The Bishop offered the parish some words of wisdom at the conclusion of the Vespers service. Afterward, His Grace anointed the parishioners with blessed oil. The faithful then proceeded to the hall for an evening meal prepared by Nina and Walter Klymenko and Vilma and Dan Rodriguez. At the meal many chatted and had fellowship in His Grace’s presence. 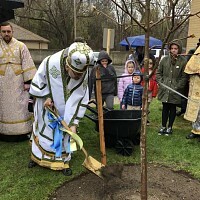 The following morning, with the procession from the rectory to the temple, Vladyka Daniel was greeted by the parishioners, with parish Warden and Vice President Michael Gursky and his wife Beverly greeting with the traditional bread and salt and with the children presenting him flowers, which his grace distributed to the ladies of the parish gathered round. Fr. Harry then greeted His Grace asking him to lead them in the Divine Liturgy. Then they proceeded to the center of the temple, which was decorated with green throughout for the feast. His Grace was vested as the Hours were read, assisted by Subdeacons Vasyl Pasakas and John Juhasz. The Liturgy of Holy Pentecost, the Great Feast of the Holy Trinity, was then served in full hierarchical fashion with the hymnody of Pentecost flowing throughout the Church. In his homiletic message after the Gospel, Bishop Daniel gave an inspiring message in which he exhorted that people that we must be examples of our Christian faith from the greatest things like sacrificing the greater things in life for another even unto smallest things, like letting people in front of you in line, or being courteous and thoughtful in daily matters. The Divine Liturgy drew to a conclusion. After the dismissal the children presented the Bishop with a beaded icon of the Holy Prophet Daniel that many of the youth of the Church school made together guided by Peggy Sieburth. Afterwards, a splendid feast on the feast was prepared in the hall. Much help went into the preparations and it was a satisfying meal. Bishop Daniel then circled the tables talking to the faithful as lunch wound down. Later, a parish council meeting was held in which His Grace offered words of encouragement and sound advice on various issues. 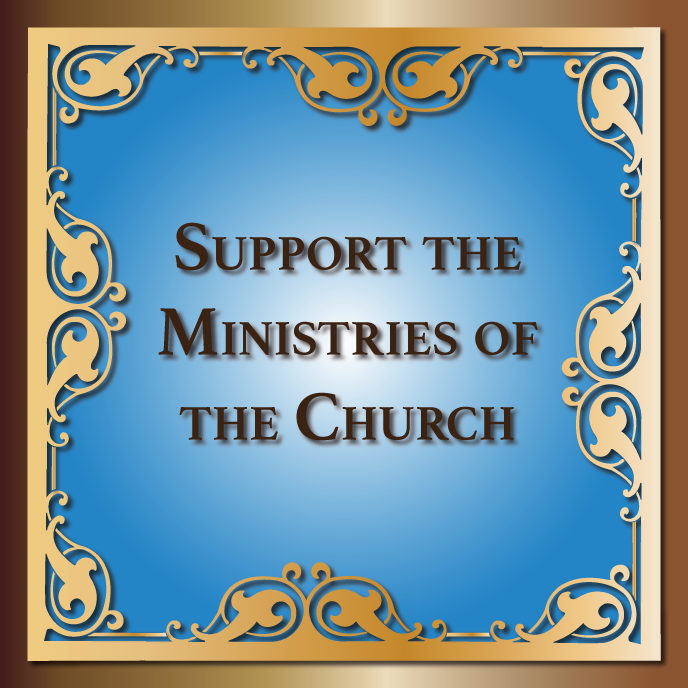 The Holy Spirit was present with fervor in the visit of the Hierarch, being able with gratitude and joy to celebrate this most important Feast of the Church with a sense of the presence of the early Church in our midst. Many years, O Master! 2010 Mission Team of Students Leaves for the Annual Trip to Ukrainian Orphanages!